It is hard for me to wrap my mind around giving just a report about the Free Farm Stand this morning as I am thinking about the take over of the Gill Track Land by the Occupy the Farm people in Albany. I actually know a number of the occupiers there who are beautiful and idealistic and they are the Diggers of our generation. My heart sings out to those who challenge the idea of private property and this does tie into the work we are doing with our Free Farm Stand and the Free Farm. 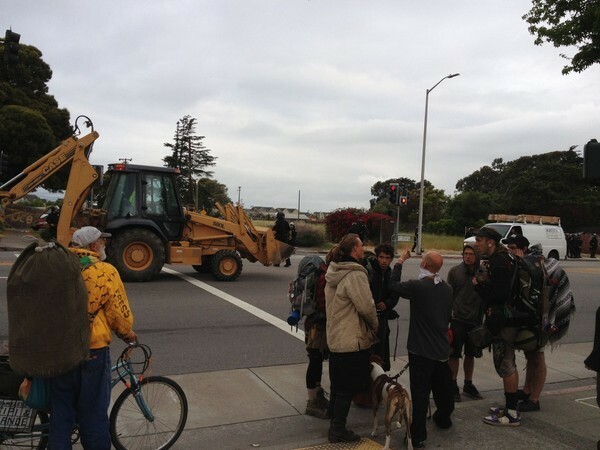 The latest news is that nine people got arrested this morning outside the land, apparently 100 UC police showed up, and a tractor was brought in (to till the land?). Apparently one protestor was up in a tree on the land and I don’t know what happen with him. Also, the law suit against 14 occupiers is still going ahead as far as I know…including suits against to two people Pancho and Anya who have helped us at the Free Farm Stand and the Free Farm. About the arrest here: nine arrested. More coverage: http://takebackthetract.com/. Though I read on Twitter some police trampled the crops. “…it also never seemed to me that occupy the farm intended to do more than dramatize and publicize the issue and show the university’s greed and hypocrisy–just as occupy wall street never really intended to actually set up a permanent village outside the stock exchange, or on any of the town squares or city halls around the country where groups sprang up last fall. I don’t think any of these actions has actually succeeded in getting any land, but that’s like saying the lunch counter sit-ins in the civil rights movement never actually got anybody served lunch. Nor did the AIM occupation of Alcatraz actually get that land or any land permanently given back to American Indians. Whether one agrees or disagrees with the idea of takeovers, I think they have to be judged on other terms than whether or how long people get to stay. To me it’s really just part of a longer, difficult process of waking people up to how much of the future is being stolen from them because of greed. …You are right that the media focuses all the attention on the illegality and the police response, while that was one of the strengths of the civil rights movement (because people were protesting unjust laws) it is one of the dangers of takeovers, because more people have a knee-jerk idea that the laws that protect property ownership are legitimate. I also think that the Occupy movement must take a strong stand on it’s commitment to non-violence and also to serving the poor. We need more commitment to love and peace in our direct actions and no one should go hungry in our world or feel like they have to make choices between getting health care or rent vs food. I also think that the Occupy must take a firm stance against money exchange and capitalism no matter how friendly. For example, I never heard a clear statement where the food would be going that was being grown on the Gill Track Land, though I did hear that the tomatoes that were planted by Professor Miguel Altieri were going to East Bay soup kitchens, as they have for years. On the weekend they did have a Mothers Day 3 week celebration of the occupation and one of the workshops being held was on setting up a CSA. To me CSA’s are examples of “good kinds” of capitalism and they are a better way of getting produce versus shopping at a supermarket. I think Free Farm Stands are better. Yesterday I noticed that the beautiful piece of vacant land on the corner of 15th and Dolores was finally being developed. It once was a church and then a fire burned it down. Then it was a community garden. Now it is being developed into housing…probably for rich folks or people who can afford the high cost of rents. I think development should stop everywhere in our cities and especially any land that is not built on should remain open space. For example ,the agricultural part of the Gill Track should be open to the public and should be preserved for farming and growing food and flowers for those people in need. The rest of the land shouldn’t be developed either, but preserved as open space. The creek should be restored and if nothing else the land should be preserved as a park. We had another great day at the Farm Stand. 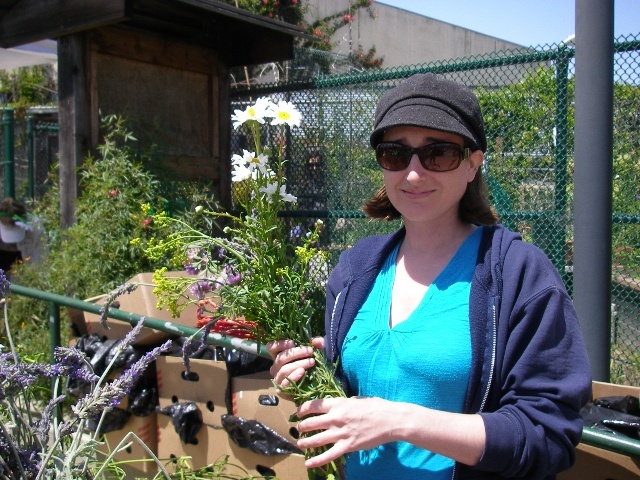 On Friday I helped harvest mostly greens from the 18th and Rhode Island garden on Potrero Hill. That is a beautiful example, probably very rare, of a landlord offering his vacant land up to the community to be used for growing food. The San Francisco Permaculture Guild has a food forest growing there and since one of their principles is fair share, the food goes to the Free Farm for people in need. I didn’t bring my bike cart but was still able to haul home 11lbs of greens, mostly Tree collards. 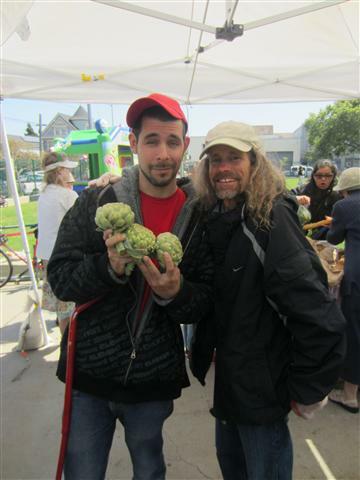 Erk dropped off about 12 pounds of local lemons, Alicia from FARM next to California College of the Arts brought fava beans and some flowers for Mothers day, and Zack dropped by with more artichokes from his garden. 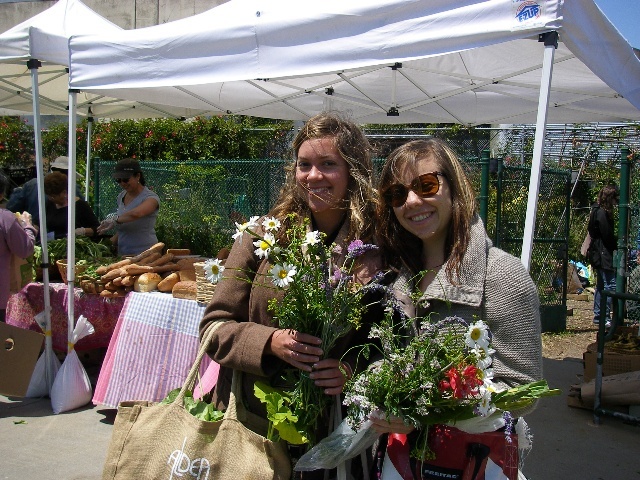 We also brought flowers from the Free Farm and fava beans too. We also gave away a lot of seedlings of tomatoes, basil, and summer squash.